Smarty yours turned out pretty good. It is one of your better customs I think. Brent- I really like yours as well. I get a kind of Hermi Odle-ish vibe from hom. I do like the snaggletooth he has got as well. Unless the robe is supposed to be removable I think I'd switch the body out for something else. There is no need to hide such a good body under the robe. Ben- Your sculpts are fantastic. I never watched Farscape but I do recognize all those aliens and you seem to have nailed the likenesses. I think that the body could use a new paintjob, just something to make it look less like a Mon Mothma body. I'm glad you joined up here I'm really looking forward to seeing more of your customs. I started on a headsculpt last weekend. I was trying to think of something to do when I looked at my dog who was lying next to me as I customized and I was more than a little influenced by him. I just have to add some more texture to it and cure it then I may cast it. Smarty- I like what you did on the Kallesh warrior. Im not sure I would have given him Mauls saber though. The soft goods work very well on this. Good work. Jedi Master Ben- Im not sure if Ive ever commented on your work, but its nothing short of outstanding. The Babylon 5 figure is phenominal. I cant wait to see her done. BTW I would kill for that G'Kar head. He is my favorite character in the series, and beleive it or not was going to be my entry for this project. BUt lets just say that my ideas are much better than my sculpting ability will allow. Should you ever decide to cast them let me know. Ive really got to get on the ball with this one. Its really embarrassing to see all this good stuff and not be a part of it. I am back with the finnal sculpt of my Senator with the Babylon 5 head. I am calling her Senator Toona Solbar (thanks Chewie ). Next stop, molding. I am not going to do a wax sculpt of her, because the head turned out ok, and second, i do not have any wax at the moment . Since this is my first entery here on this forum, how do I get the finnal pic posted for submission. Who do I need to send it to? Since this is my first entery here on this forum, how do I get the finnal pic posted for submission. Who do I need to send it to? Just post the finished version here in this thread and I'll add it to the image thread at the end of the month. I just finished my entry this morning. I made a mold of the head and made a cast of it. I just now finnished the finnal paint job on her. I did take into consideration of painting the body a diffrent color, but when I put the head on and painted her, she looked perfect to me. So her she is...Senator Toona Solbar the Minbari representative to the Republic Senate. Here is a close up of the head sculpt and paint job. I hope everyone will enjoy . Dude I saw this in you own thread completed but decided to post here in the MCC thread. MAn oh man are you skilled, You should sell casts of these on Ebay, I'd definately buy some. Ben, this is spectacular. I like the white robe you left for her. This truly fits in the Star Wars universe. Wow, I wish I could sculpt like that, amazing!!! Hod the Blind Amill will appear in the Rykrof Enloe Series. He is one of the last members of a dying species, he is also blind. I commented more in your thread Justin but I think this is your best figure to date. The paint app is phenomonal and the parts flow together beautifully. This was better than I was imagining it would be. Ben your headsculpt is top notch. And the paint on it looks very good, you did a great job on the eyes, those can be very tricky. I think that the robes need some new coloring though, it is rather bland right now. Even some sort of brown earth tones would look great, just give it some new color so the robes don't look so close to the skin tone. Commander_Miseria: I have to be honest with you and say that I did not read that book this figure is based from. It is very interesting and a great choice of parts. 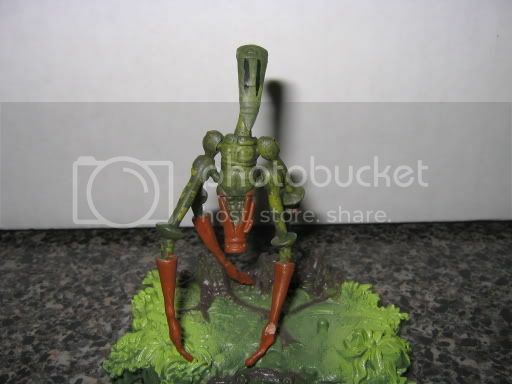 Very obscure looking alien. Good job. BrentS: Very nice sculpt. I like this head. Very original. I love the big snaggle tooth sticking out, great job. If I had to critic anything on this, it would be the eyes. I know how hard it is to sculpt eyes. I had to make a special tool just to get the desired shape. My best resource for this is the anatomy for the artist book. It is a great asset. Overall a fabulous figure!!! Smartypants: I already comment this figure in a massive coverage on your thread, but I will echo my comment here on the figure in this thread. MCC Sith Lord Grisgo - interesting design. I am not a big fan of soft goods, but in this case, it works ok here. Now if I could turn you to the sculpting side…this figure could standout with sculpted detail. Just my two cents. I do want to add that I do like the color scheme of this figure. Choosing a color scheme is not the easiest choice to make for me. I guess that’s why I will never be a costume designer . Your choice for this figure works well. Great job! Chewie: OH MY GOD!!!!!! I am humble before your greatness . This is AWESOME!!! I would have never in a million years would have thought there was any use for EPHANT MON other than maybe the Hermi Odle. I take it you used the Stargate beast of burden as the head? As usually, the paint scheme is phenomenal. I love the back-story of this guy. I would never would of thought to make it blind. Pure genius!!! I'm not worthy, I'm not worthy...ect . Overall this has turned out to be a very fun project. I can't wait to see more! I have to tell you, I am having a ball with this topic! I was so happy the way my Minbari head turned out, I went back and started to redo my Centauri head. Here is the work in progress. I do not know if I will finnish before the end of the month, but I did want to share the progress. Since I do not have but a few loose figures with ball joint necks, I sculpted the head on the only male body I had. So, just for fun, here is the Centauri Smuggler. And yes, the next head I will sculpt is a G'Kar. Let me know what you think. CHEWIE, that is superb! It looks so realistic. If Hasbro were to release that, I would buy 3 of them. (More than my average rate of the same figure) Where did tht head come from? I just didn't/don't have enough time to participate in this challenge, but everyone's entries are amazing! JediMasterBen, your sculpting & paint apps look completely professional and are very believable as background aliens. i really am enjoying seeing your work. 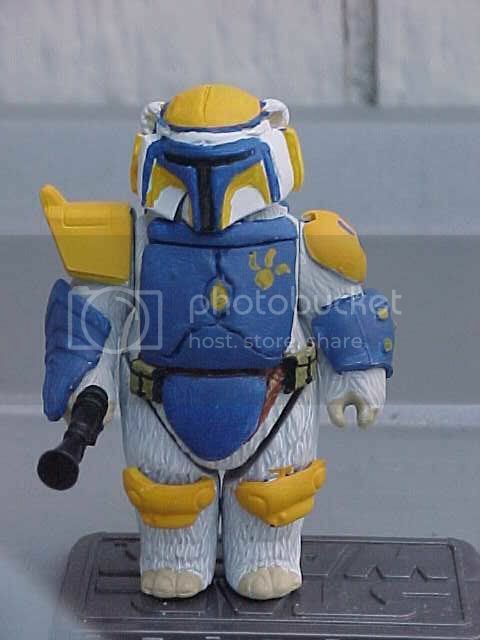 Chewie - this has got to be your best custom to date. the paint apps, colors, and the way the head fits the body...its something you should be very proud of. the wash on the skin is very realistic looking! the creature kind of reminds me of something from the dark crystal too....i loved that movie. Wow, Chewie and Master Ben you guys are just out of control, your figures are fantastic, I wish I had half of your talent, please let us see more pictures of your work!!!!! Thanks everyone, and congrats to everyone on their work on this. As for the one I made, I hardly consider it to be that good. It's just a great sculpt by Hasbro and on the head, I lucked out that it fit so well. The sculpt is what makes the painting look good, not my painting. Looking forward to the next project everyone. Have we decided what it will be?